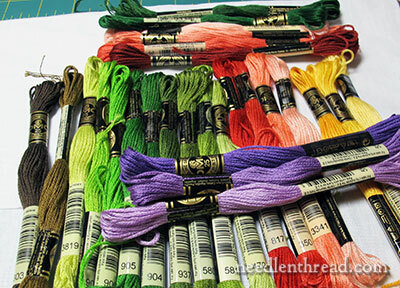 After comparing several different types of cotton embroidery threads to use in the Secret Garden Hummingbirds embroidery project, I finally came to a painful conclusion. Why painful? Because I was convinced that I would use a combination of floche and coton a broder. I love working with with those threads. And I didn’t want to not work with them. And, to tell you the truth, the whole project would be much easier with those threads (more on that, later). But you know what? 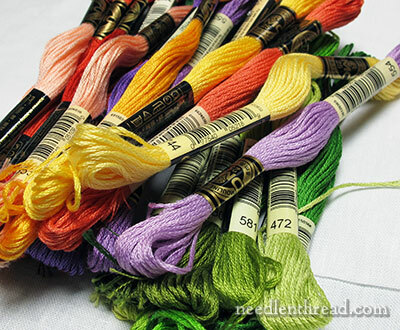 DMC stranded cotton – which is the most widely available embroidery thread, at least here in the States and I think in many other countries as well – is a good choice, too, and for good reasons. So that’s what I’m going with. Keep in mind that this is my choice, but it may not be yours. If you want to use a different thread, go for it! This is the main reason for my decision. I have the complete set of DMC stranded cotton floss, and then some. And when I laid out all my green floche and all my green coton a broder, I realized just how limited I would be limited in shades of green. If you’ve taken a really good look at the design, you know that vines and leaves make up a good bit of the picture. I wanted at least two color values of green that had a range of shades available and that didn’t clash. With floche and coton a broder, I didn’t have as broad a base to choose from. 3. I love stitching with them – they feel good! I thought the pros for the stranded cotton outweighed the pros for floche and coton a broder. 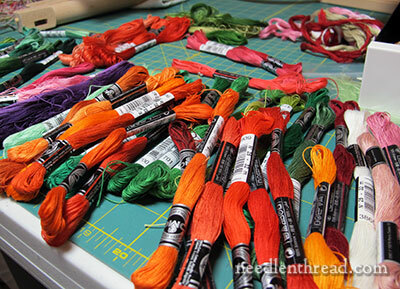 Once I decided on the stranded cotton, I had to narrow down my initial color choices. This doesn’t mean that my color choices are absolute at this point. But I needed some colors to start with. 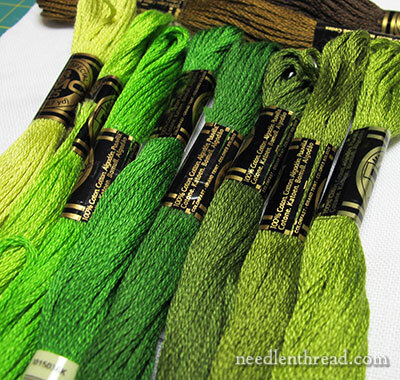 Because I want a springy, bright piece of embroidery (I’m desperate for spring right now, and the design lends itself to vivid colors), I chose a range of greens that are grassy and bright (on the left), and a range of greens that are a little more subdued, but not too subdued (on the right). They’re not the same types of greens, obviously, but they can work together without clashing. Again, the choices aren’t absolute yet – but this gives me somewhere to start. Then I thought in terms of the flowers in the design. There are 8 flowers, and I don’t want them all to be the same color scheme, so I settled on a red-to-coral range (I always prefer red-to-coral as opposed to red-to-pink, but that’s just me) and a smaller purple range. I also selected a range of yellows that work together and that work with the rest of the colors. You’ll notice a couple browns in there. I wanted a twiggy brown and a dark brown, just in case. I’m not sure I’ll use the dark brown, but it may come in handy. And at the top of the photo above, those are “extras” that work with each color family, in case I want to go deeper or lighter with any of them. You can see some of the thread numbers in the photo above, but I’m not really ready to give you a list of the thread numbers I’m using, yet. Why not? Because I may change the colors. And if you are following along with every minute detail, then you may end up buying threads you don’t need. I’ll mention the colors I’m using as I go through the project. These colors may not work for you, anyway. I find that color on a project like this is a Truly Personal Thing. For example, I have a huge aversion to mauve-y pinks and plums, unless they are part of a needlepainting piece and play the shadows. As a dominant color in a piece of embroidery, they wouldn’t be a choice for me. But other people love them. Pick colors you’ll enjoy using! This is more important than you might think. We’ve all experienced the initial excitement of beginning a project, right? You’re all keyed up. It’s always on your mind. You’re always thinking ahead to which technique or stitch will work where. You find yourself planning your days and weekends around time to stitch. You’ve got your threads together – you’ve got your favorite scissors out – you’ve picked out movies to watch, music or books to listen to while you work – you’ve put everything together and you’re rip-roarin-ready-to-go! Housework, laundry, cooking – you’ve secretly written those off, at least for a while. You’ve decided where you can take shortcuts in your homework (tsk, tsk), you’ve cut back on social plans. You’ve minimized everything, because you’re really eager to get going on this beautiful, new, exciting, project! It’s Thee Project. The One Project You’ve Always Wanted to Do! Oh, the buzz of starting a new project! But then you get about one third of the way through that Wonderful Project, and you lose a little of that steam. The edge is off your excitement. In fact, the project is looking a little bigger than you initially thought. It’s a little more complicated. You’ve been looking at it for a long time, after all. And now you’re starting to feel guilty that you don’t love it quite as much as you did. You don’t plan your days around it anymore. You find other things to do on the weekend. Finally, you start finding excuses not to work on it. We are Much Less Likely to go that route if we choose colors that we love. Sure, it’s not always color that does a project in, but color can do a project in. We can get bored with colors pretty quickly. So pick colors that you love. When you pick your colors, write them down. I have a small notebook I keep project notes in, where I write down all kinds of things about the project. For this particular project, I’ve got lists of pros and cons for the different threads, written down as they occurred to me. I have lists of the colors I’m using and their description. Some of the colors have remarks next to them or question marks if I’m unsure of them. 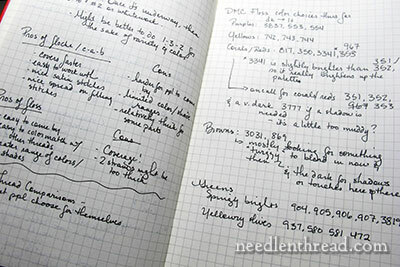 I keep notes of anything that I might want to know later about the project, from ground fabrics to threads to stitch choices to needle sizes, because I can’t rely on remembering the details, especially if I change my mind as I go. Even if you don’t keep a thorough list of project details, at least write down your thread numbers with a color description. You never know when you’ll lose that number tag! So here are my initial starting colors. If you want to follow along with the Secret Garden Hummingbirds Project, you can find a list of all the articles relating to the development of this project in the Secret Garden Hummingbirds project index. Well, it’s easy to see why your projects are as exquisite as they are. Write it down? Who ever heard of such a crazy thing? ha ha The numbers of the thread? Who ever lost a number? ha ha Yes, if I approached it like that, I would be more pleased with results. Perhaps you’ve tweaked to me to habits! Can’t wait! But since I have all of my own DMC and all of my mother’s DMC, this should be a cheaper project for sure! 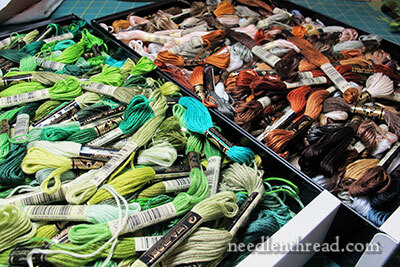 Wow what a stash of coloured thread the whole DMC range how wonderful. I love the colours you have chosen red, yellow greens all the colours I would have chosen for the project if I was following you. I agree about choosing colours you love, when I was embroidering the Guardian Angel it called for mostly blue not my favourite colour and one stitch split stitch I did get bored with it after a while and it took quite a while to complete but I perservered and completed it, but in hind sight I would not have chosen blue to work with. I hope you rip-roaring going you sound so excited I’m looking forward to your updates on this project as it will give me ideas on future projects, I’m just thinking about Tambour stitching, practice first wish me luck. Thanks for your reply glad you are revisiting Tambour work can’t wait for that. I know what you mean Anita! I did three panels to be used in a quilt. Finished the first one that had all lettering fairly quickly but was sick of all the stem stitch although it’s my favorite “outline” type stitch. Put it away until the 2nd winter and finished panel # 2 which had trees, fences and houses. Put it away and it took me two winter seasons to finish the last and more elaborate panel and I hope to never stitch a forest of trees again. I am so glad they are finished because once I start something I have to eventually finish it, even if it takes years. I have been ruminating these last couple of weeks on color, since I want my two birds to Pop right off the fabric with brightness. I have picked out my colors for them, now I want to come up with names, other than Frick and Frack. The leaves and such I thought I’d wait and see what you pick, since shading is not, I repeat, Not one of my stronger abilities. The birds will be easier for me to do than all those leaves and vines. That is a lot of green going on, yes indeed! I am very happy that you are so good at what you do, and I can just follow along after. I have picked out a varity of flouche, perle cottons, and startard floss, in a wide variety of colors, including some varigated to use to represent gravel. I also have some tiny gathered ribbon flowere to scatter around, and a few tiny clear beads to use where I want water drops. The water well about 24 pages in caught my eye and imagination. At the base of the well there is gravel to provide a dry and secure footing even if some water is spilled. Like you I am not positive yet which threads will go where, but the picture does not demand perfect conformity. I still need to pick out an angle for the light source. I had not thought about writing the information down, so I will begin with that. That will also give me a chance to group together what I have to match DMCs idea of which shades go together. Thanks for this post. I love to hear the how/why others choose materials. your choices are similar to the way I select crochet threads, love the colors! Oh, I agree with you – on both counts. It’s fun to use a different thread from just plain old stranded cotton all the time, but there are distinct limitations and, yes, colour is the over-riding one. I’m an Anchor user and have pretty much every one of the Coton à broder #16 shades and have my eyes on the #25 selection as it looks a great gauge and I like it. BUT: Hardly any colours! Way fewer than DMC even. I can’t even seem to find a colour chart anywhere, but I did see a couple of dozen shades available locally. Of course, not even the most useful shades either! I think they should survey customers when it comes to deciding which shades to produce in ‘other’ thread ranges. Thank you for your teaching and the lesson of colours.Your choise for the green is very beautiful and very “fine” (not easy english for me), delicacy and amazing feat (dictionnary)because if you see in left green “anis” and the 2 or 3 in right, they are very different and all is beautiful.Very thank you for the lesson. I always use DMC floss mainly because it is easy and available! I was happy to see this post in my inbox today right after I had uploaded a shot to my flickr page of my thread choices for a new project. I separate my colors and never have written them down…….hmmmm….maybe I should be doing that! I love this projectand look forward to seeing your progress. Love your blog!! Thanks for the whole thing with the colours. I started on a project about a month ago and was Super Excited. But then, as I went on, I found myself ripping out stitches I’d made, changing colours I’d decided on, and eventually just given up on the whole thing. I will remember that next time. I use Anchor for all my projects because it’s the only brand available in India. Yay for DMC-to-Anchor conversion charts! Mary, I’m sorry you aren’t using your favorites, but I’m glad for myself. Colors are always tough for me and I’m glad to have your advice. Also, if we went with floche and coton a broder I’d have to order everything. This way I know I can get everything from my local store. I don’t see why you can’t use both kinds of thread if you wish. It’s your project. Use stranded for the eaves and floche for the flowers. There was a discussion recently on Ravelry, the knitters’website, about losing steam after starting a project full of energy and enthusiasm. I believe it’s a normal process that should not cause any anguish. It’s good to get a lot of work done in the beginning when you know the project will take hundreds of hours. At least what is done is out of the way. Then you take a breather, do some housework, laundry,etc. that is relaxing and not taxing intellectually. Don’t feel guilty for “abandoning” your project. Allow your mind to rest and when it’s fully restored you’ll feel the urge to get back to your project. It will happen! But don’t try to rush it because if you do you’ll make mistakes you’ll have to undo. 2- The color pink: There are plenty of pinks in Nature; not only flowers but also fruits, with graduated hues. I know pink evokes strong emotional responses in women. I rejected it all my life except for hot pink and fuschia but came to accept the soft color too. It’s all a matter of taste and proportion. There is to be sure a lot of vulgarity in pink, especially in girls’clothing and accessories, and commercial art. But this shouldn’t make anybody banish pink. Look at wildflowers, go to a flowershop for inspiration. You CAN indulge your secret girlish love of pink by stitching a few pink flowers! I like pink. But when working with reds, I tend to go towards coral / salmons rather than pinks. I’m not a great lover of mauve, except when used in shading. As an isolated color, I find it drab. Agree about using DMC rrgarding colors choices and available variety. Looking forward for your final choice of coloers! As a beginner I am looking forward to developing good habits when starting a project, like writing down my plans. I have lots of DMC colors, plus they are easy to purchase at my local craft shop, so I am glad you have chosen this medium. I am excited to get started and learn. Thank you. your detail explanation makes project so easy.I am happy you are using DMC cotton threads.But in India Anchor threads are available.Though there are conversion table available on net but I will be happy if you give anchor numbers also. 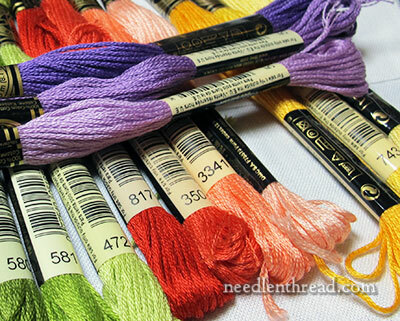 very happy to read this thorough discussion of a great accessible embroidery thread. thanks! Are you going to send a nice list of the color numbers to us or do you plan to scatter the numbers throughout conversation with us? Please don’t take my question the wrong way, I only meant it as a question NOT as an insult. PS. I am pretty new to your way of doing things, and I love reading your messages. I am probably a little ahead of myself with the question anyway. Hi, Georgia – no problem! With a stitch along project like this, I scattered the thread choices I made throughout the project, since it was developing as I went along, so you’ll find them throughout the articles, as I tackled each section.